I shared a while ago how we store our paint. Although it worked for the past 4 years, it just wasn't working now. We are trying to absorb an entire room in our house into the rest of our house. And an entire corner in our closet devoted to paint storage just wasn't using our space wisely. I came across a post on iheartorganizing about organizing paint. What made the most sense about her method was how efficiently it used space. There were many gallons of paint that we had that only had a quart or even a pint left. 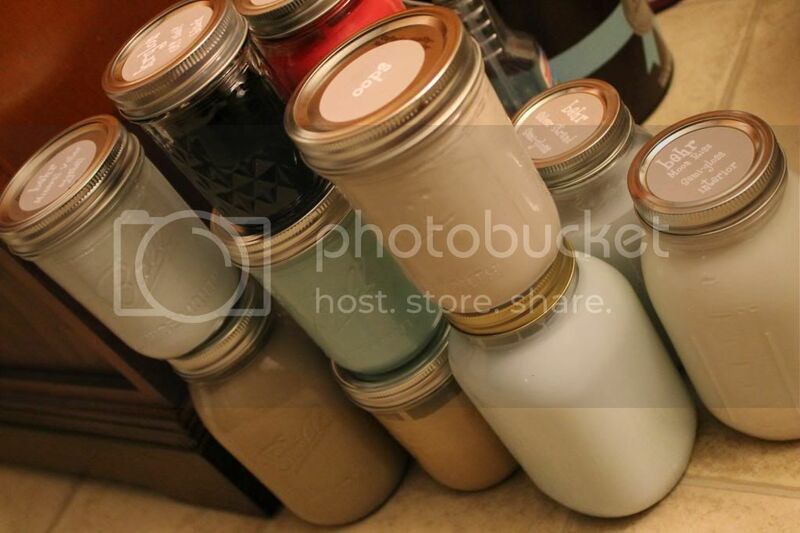 I had no idea that you could store paint in mason jars (and that it would last)! But I should have known- I had a can of Martha Stewart sealer in it's original can and every time I used it, the lid would be sealed shut. I poured it into a mason jar and it has kept for over a year! I just never put the 2 and 2 together. 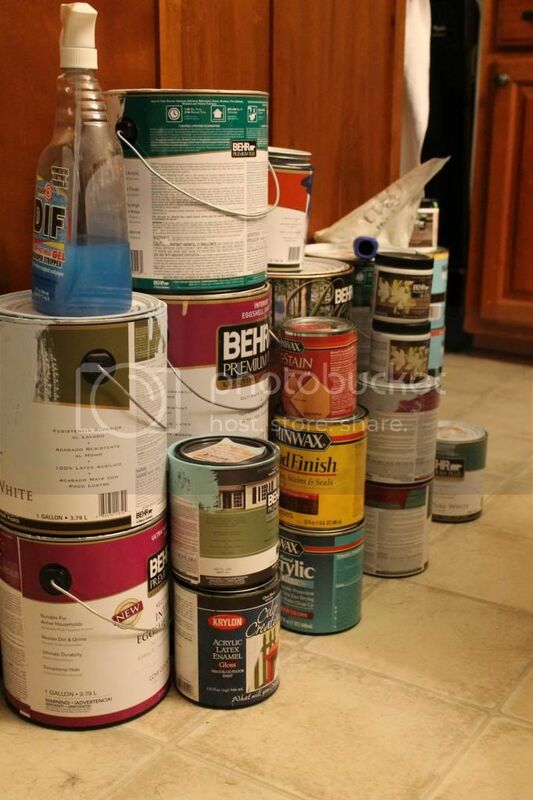 Here was all the paint that came out of the closet- wow how it accumulates over the years! I started this project by buying 2 inch round stickers. 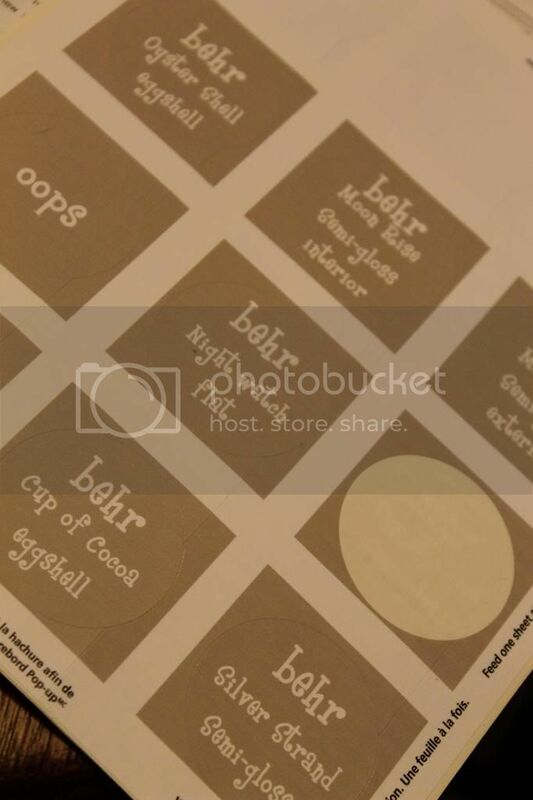 In the iheart tutorial she used her Silhouette (print/cut feature). I didn't want to buy something I hadn't tried before, so I found the 2 inch stickers at Wal-mart. I went to the Avery website and downloaded the template and started designing. Although I played around with it for a good 2 hours, I decided going with a neutral gray with white letters. I used the font "boyz are gross". One perk of using my Silhouette on my desktop computer is having all my pretty fonts downloaded! It took a couple tries (and I had to buy an ink cartridge mid-project) to get it perfect. 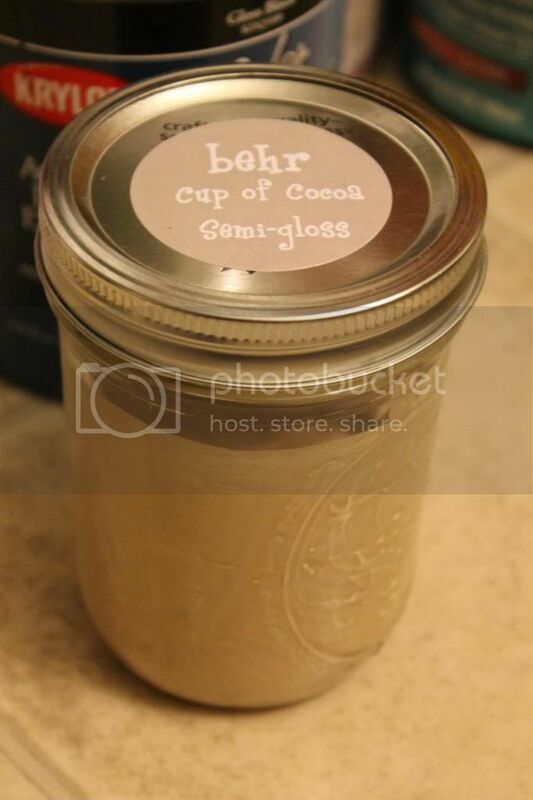 I included the brand of paint (mainly Behr), name of the paint, and what sheen I used (eggshell, satin, semi-gloss, etc.). I LOVED the inspiration blog and how she used different colored labels but I felt myself going slightly ADD with seeing the colored label and a different color paint. It was just too much for my brain. 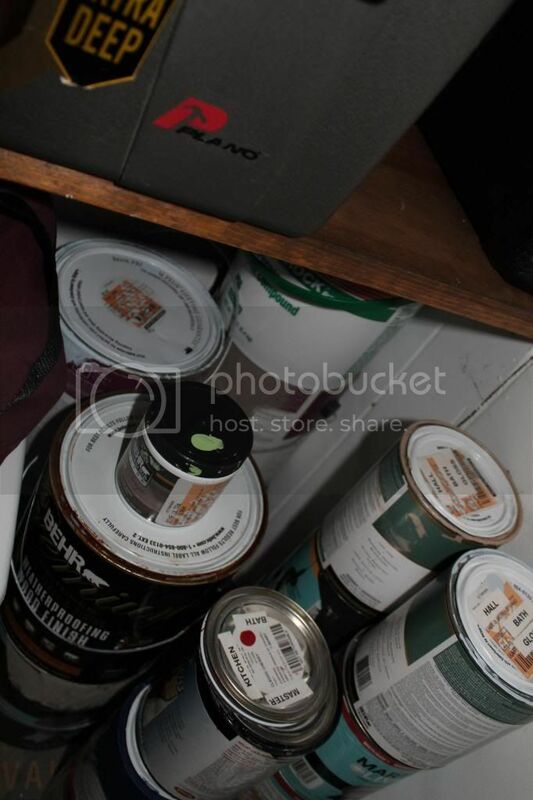 Another idea is to make the label the color of the paint? The easiest way to pour the paint was to make sure there was no rust around the rim (if there was I tried to scrape it off without letting it fall in the paint). Then I used a spoon to help with the paint flow. A spoon was 100xs easier to clean up between each paint color than a paint brush. I started with a paintbrush to scrape the sides of the can, but it would get too wet after washing and obviously wouldn't dry in enough time to do the next color 5 minutes later. I was shocked at how rusty many of the cans were. Fingers Xed that the mason jars solve this problem! 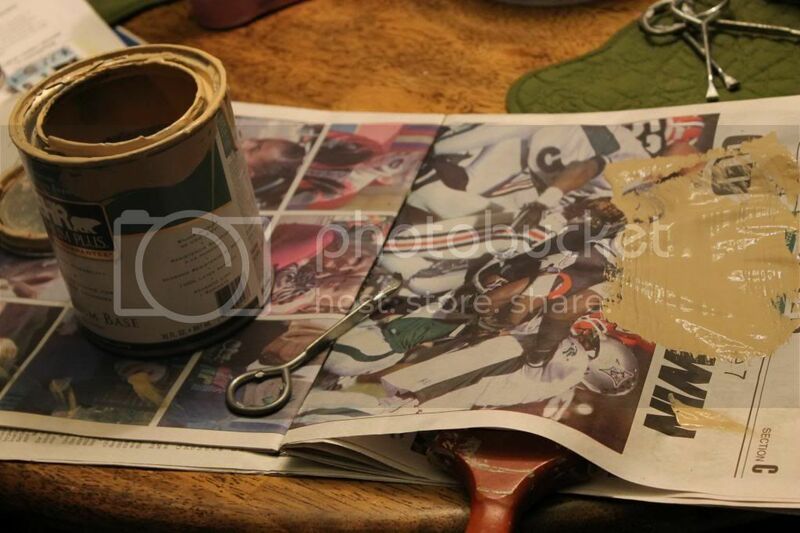 As that picture shows all of the paint needed a good stir. There was no fancy way to get it in the jar- I just used a steady hand. Likewise there was no exact way of knowing whether to use a quart size jar or a pint size jar without just eyeing it. 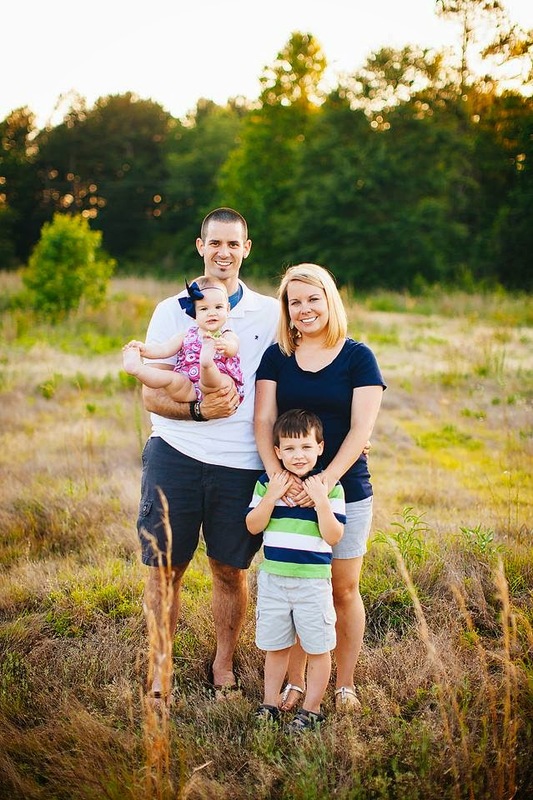 We realized that we are huge fans of neutrals and blues! Also if we had any barely used or unopened gallons, those stayed put. The jars are mainly for touch-ups/other small projects. 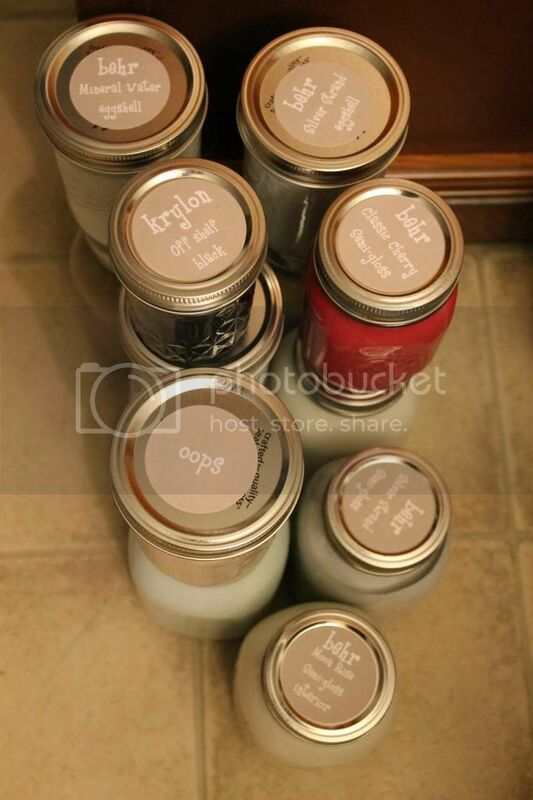 It would be slightly annoying to have to use 4 quart size jars (and 4 stickers) just for 1 color. The "oops" is paint I buy off the shelf on sale. I use this to paint closets. I always look for light neutrals. It saves 50%-75%! It's amazing how much space the mason jars save!! 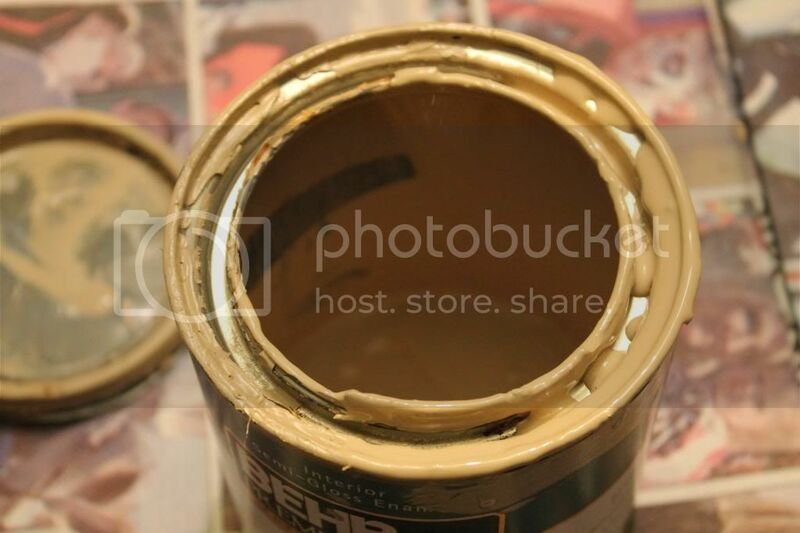 This amount of paint is the same amount that was in the first picture. It really saved us a ton of space!